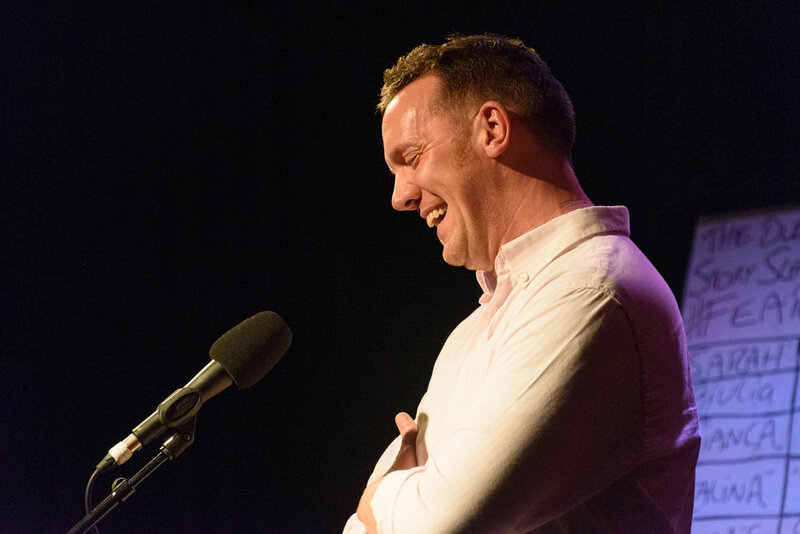 On October 16th I went to the monthly Dublin Story Slam in the Sugar Club, on a whim. A few friends had said they were going and I had heard various people speak about the night previously. I looked up the theme and saw it was Fear and thought to myself, maybe I’ll speak about Liane and face a fear in doing so. That day, between classes, I took out an A4 piece of paper and drew a spider diagram with her name and the word ‘fear’ in the centre. I wrote some phrases, some words, some ideas and tried to merge them into a coherent shape of some variety. I’ve told Liane’s story so often, to so many people and in so many ways that I presumed it would be easy. It wasn’t. When we got to the venue it appeared sold out so a mate told me to go up and say to the organisers that I’d speak, allowing me free entry and them the relief of having another speaker (apparently some nights it can be hard to find 8 brave souls). I was ushered in, signed a form, my name went into a hat along with 7 others and then I waited. The room filled slowly but surely until it was at capacity with people standing in the aisles. My stomach lurched. What was I thinking? One by one the other names were drawn from the hat and people spoke about their fears. Some were finely tuned others seemed like rambling nervy wrecks. The standard seemed quite high, especially a beautifully touching tale about a Romanian woman coming out to her homophobic father. I was called up 7th of the 8 speakers. We had 4-7mins and I think I lasted about 4.5mins. I left the stage feeling like I’d done Liane a disservice. My anxiety overrode my adrenaline and allowed me think I’d done her wrong somehow. I hadn’t conveyed her strength, our love, her resilience, her fears or anything close to it. I was dejected, and despite being called up as the winner on the night I left for my cycle home feeling sad. In hindsight that’s a harsh view of what happened. I was nervous, fearful and under-prepared. I spoke eloquently for the most part and didn’t break down on the stage in front of 200 strangers. I left those present with hope and yet still opened up about grief, showing my pain and my fear in public. And all of that was exactly why I pushed myself to go in the first place.